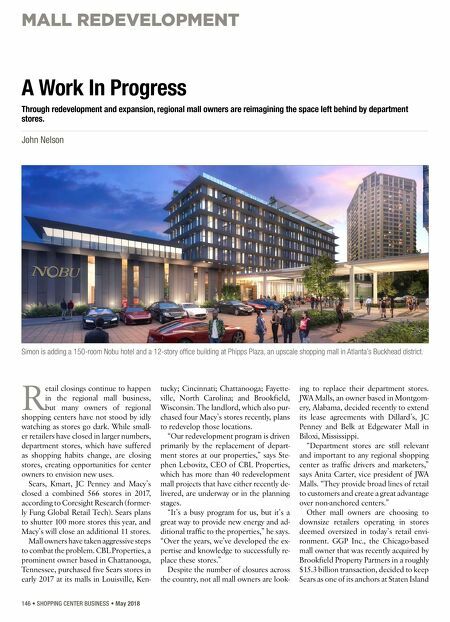 MALL REDEVELOPMENT 146 • SHOPPING CENTER BUSINESS • May 2018 R etail closings continue to happen in the regional mall business, but many owners of regional shopping centers have not stood by idly watching as stores go dark. While small- er retailers have closed in larger numbers, department stores, which have suffered as shopping habits change, are closing stores, creating opportunities for center owners to envision new uses. Sears, Kmart, JC Penney and Macy's closed a combined 566 stores in 2017, according to Coresight Research (former- ly Fung Global Retail Tech). Sears plans to shutter 100 more stores this year, and Macy's will close an additional 11 stores. Mall owners have taken aggressive steps to combat the problem. CBL Properties, a prominent owner based in Chattanooga, Tennessee, purchased five Sears stores in early 2017 at its malls in Louisville, Ken- tucky; Cincinnati; Chattanooga; Fayette- ville, North Carolina; and Brookfield, Wisconsin. The landlord, which also pur- chased four Macy's stores recently, plans to redevelop those locations. 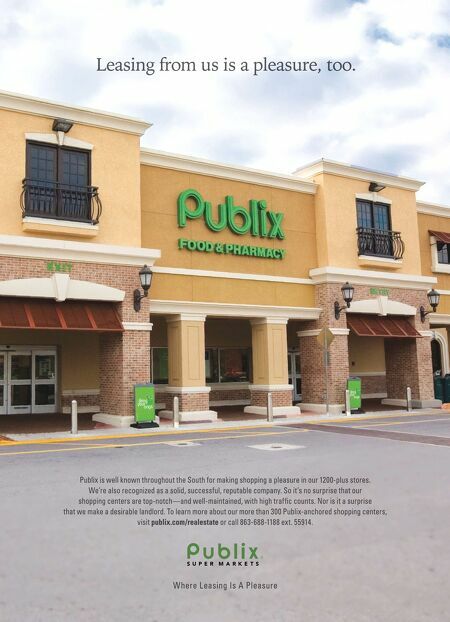 "Our redevelopment program is driven primarily by the replacement of depart- ment stores at our properties," says Ste- phen Lebovitz, CEO of CBL Properties, which has more than 40 redevelopment mall projects that have either recently de- livered, are underway or in the planning stages. "It's a busy program for us, but it's a great way to provide new energy and ad- ditional traffic to the properties," he says. "Over the years, we've developed the ex- pertise and knowledge to successfully re- place these stores." Despite the number of closures across the country, not all mall owners are look- ing to replace their department stores. JWA Malls, an owner based in Montgom- ery, Alabama, decided recently to extend its lease agreements with Dillard's, JC Penney and Belk at Edgewater Mall in Biloxi, Mississippi. "Department stores are still relevant and important to any regional shopping center as traffic drivers and marketers," says Anita Carter, vice president of JWA Malls. "They provide broad lines of retail to customers and create a great advantage over non-anchored centers." Other mall owners are choosing to downsize retailers operating in stores deemed oversized in today's retail envi- ronment. GGP Inc., the Chicago-based mall owner that was recently acquired by Brookfield Property Partners in a roughly $15.3 billion transaction, decided to keep Sears as one of its anchors at Staten Island A Work In Progress Through redevelopment and expansion, regional mall owners are reimagining the space left behind by department stores. John Nelson Simon is adding a 150-room Nobu hotel and a 12-story office building at Phipps Plaza, an upscale shopping mall in Atlanta's Buckhead district.